So much assurance in such a short verse! 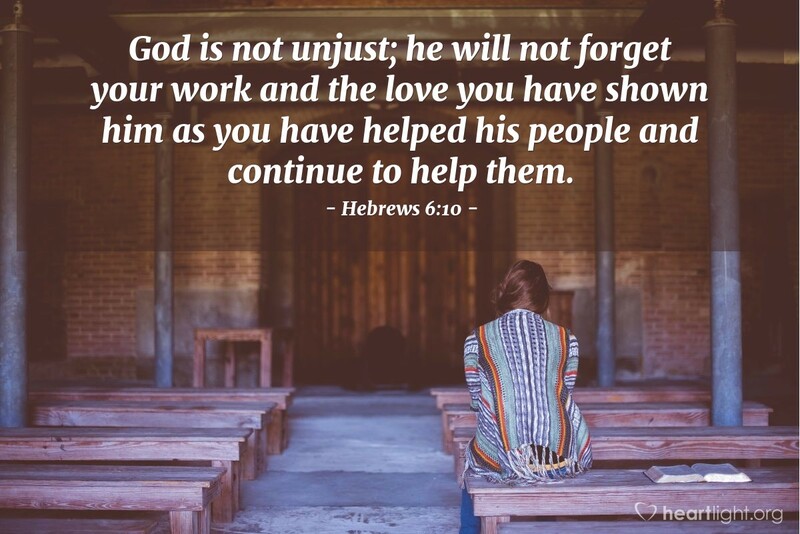 God is not unjust — boy is that an understatement: if he produced the atoning sacrifice for our sins, what will he deny us if we seek after him? He will not forget our work and love — an eternal record of the good we have done! When we help our brothers and sisters in Christ, we bless him! We are HIS people!! That's real motivation to keep on maturing in Christ. God, you are so gracious. Thank you. Words cannot express my joy at hearing such a simple and profound statement describing your virtues. I am so glad I am your child. Through my brother Jesus I pray. Amen.